What Makes Music Sound ‘Haunting’? Western music has two main modalities; major or minor. Most people intuitively know what the difference between major and minor is, and often a question beginning musicians are asked is whether the music sounds ‘happy’ or ‘sad’. Minor music sounds sad, or sometimes spooky to us, and this is largely the result of familiarity with Western music, which tends to associate major keys with ‘happier’ sounds, and minor keys with ‘sad’ emotional affects. Dissonance is the term used to describe pitches produced together which sound disharmonious to our ears. Generally these pitches are close together – like a minor second. The sounds produced together are very jarring to our ears, and can increase our sense of discord, which sounds ‘spooky’. Another way in which dissonance makes music sound ‘haunting’ is when a note which doesn’t belong to a chord is used. This note ‘clashes’ with the others in the chord, until it resolves to another note which does belong in the chord. This creates a sense of tension and release; an important element in creating a ‘spooky’ atmosphere! Our instruments are capable of a lot of unique sounds, including the ability to mimic sounds that we might associate with creepy situations; wind instruments can mimic howling wind, or rustling bushes; strings can mimic the creaking of doors, or old floorboards, and can even sound like screaming; and percussive instruments can sound like the rattling bones of a skeleton. Many composers use these elements to create a ‘haunting’ affect to their compositions! 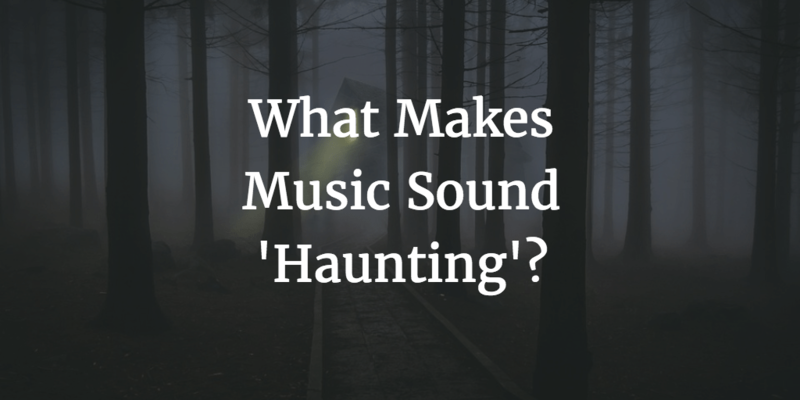 What else makes music sound haunting? Tell us in the comments below!